Lumens? Watt you talkin’ about? Before you commence reading this eye-opening entry, I must apologize for the horribly “punstastic” title. I’m nearly 100% certain that it would’ve received a few snide stares during “pun wheel” (a warm-up exercise commonly used by my improv group). Moving forward, let me shed some light on the subject (shucks, I did it again) of lumens and the future of lighting. Christmas Lights — LEDs or CFLs? Is There a “Right” Lighting Solution? Christmas Lights … scrooge or savior? (an annual refrain …) Do you love those displays of Christmas (or Hannukah or Kwanza or …) lights? 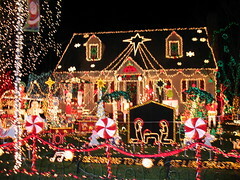 Are you awed by those so impassioned that they string up 1000s of lights in awesome displays worthy of a city center? I once did, pausing on cold winter nights, white clouds issuing from my mouth, enjoying being in the glow of beautiful displays. And, in a way, I was inspired that they would spend $1000s (or $10,000s) on displays and the electricity to power them so that others could enjoy the sight on those cold winter nights. But … no longer … not for awhile.